I hadn't really thought about the post ceremony "throw something at the bride and groom" part. I have seen fun pictures of bubbles, ribbon wands and sparklers, but nothing really caught my attention. These lavender cones have gotten me thinking. They are an environmentally friendly option. They also smell really wonderful. Lavender is one of my most favorite scents. It is just so organic and relaxing. I would love to be surrounded by this as I walk down the aisle. I wonder how it would photograph when tossed. Has anyone seen this done? Here is a link to the DIY instructions and a spot to buy the lavender. we did lavender. it smelled REALLY strongly. it got in the car and made my dh's car smell for a loooong time. he now despises the scent. i thought it was a good idea at the time, but... i think i'd stick to nothing or one of the other ideas if i had a do-over. I think I am scrapping this idea! I heard a lot of horror stories after posting this on weddingbee. 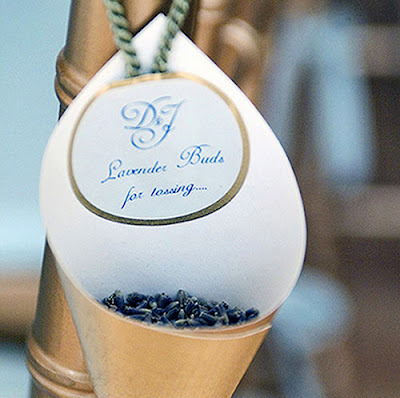 Maybe I will just stick some lavender in my bouquet or purse. You could always try putting them in little glass bottles like I did. It keeps the scent contained until it's ready to use in addition to still being really decorative. I did it for my upcoming wedding and they were just a little over $2 in raw materials for a 2-person portion!